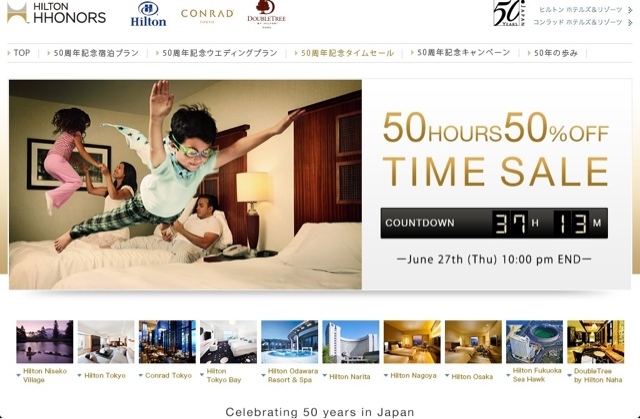 Offer is subject to availability at participating hotels within the Hilton Worldwide portfolio in Japan. Book between June 25, 8pm, 2013 and June 27, 10pm, 2013 and stay between June 26, 2013 and 31 March, 2014. Full non-refundable prepayment required at time of booking. Your credit card will be charged immediately for the total amount quoted for the entire stay as reserved and refunds or credits will not be issued. Charges cannot be applied to other stays, services or merchandise. Booking cannot be changed. Blackout dates may apply and vary by property. Additional restrictions apply. This offer may not be combined with other select promotions, offers or discounts and is not valid for existing reservations or groups.